It’s floodin’ down in Texas. The city of Houston has spent weeks on the receiving end of record-setting, near-biblical rainfall. Huge chunks of the city are still underwater, and hundreds of people remain displaced from the floods. It’s not exactly an ideal setting for a newly opened music venue to host its first day festival – but that didn’t stop White Oak Music Hall from throwing their Memorial Day Blowout on Sunday, and it surely didn’t deter the crowd. They just did what Texans do – traded their trucks for canoes and came to party. For anyone who has not yet been, White Oak Music Hall is a live music lover’s dream. They worked wonders with a relatively small space, nestling two outdoor stages comfortably at the front of a lush lawn. The bar staff is friendly, security is swift and efficient, and even the lines at the bathroom seemed to move more quickly than at most music venues. It’s obvious that the folks running White Oak understand the crucial partnership between themselves and the fans. Happy fans who love your venue will not only spend their money there, but they will lead to bigger, better acts in your space. As for the crowd on Sunday, they were the crowd you want at your show. In the midst of the high water chaos, festival goers braved 90 degree heat and the notorious Houston humidity simply to celebrate music in the outdoors all day. While the show itself started shortly after noon, headliners The Flaming Lips weren’t set to take the stage until after eight that evening, and the lawn stayed comfortably packed all day. Everyone seemed content to brave the heat in exchange for a few hours of precious sunshine. The day’s opening acts came from all over the musical map. Psychedelic rock legend Roky Erickson played a set early in the day, as did underground power-pop veterans Nada Surf. Nashville was represented by the ambiance-fueled vocals of Adia Victoria, and Houston acts Lost Element and We Were Wolves were on hand to provide some local scene support. Body/Head, the newest project from Sonic Youth’s Kim Gordon, had to cancel their appearance last minute; but it didn’t seem to put a damper on the day. When Memphis alt-country/punk outfit Lucero took the stage, the crowd was ready. The temperature had begun to drop some, the lawn reached its fullest point of the day and they were ready to sing – and sing they did. While the set was brief, the band tore through fan favorites like “Texas and Tennessee” which served to get the crowd in high and celebratory spirits. It was apparent that even those who were not singing along at the top of their lungs were being converted to new fans of the soulful, raspy, hard-luck heroes. 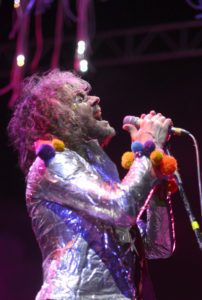 Just after the sun slid out of the sky, the unique, freakish wonder that is The Flaming Lips finally took the stage. If you’ve never seen this band live, go find out the next time they’re playing near you. There is a reason – scratch that, a slew of reasons – they are on the list of “50 Bands to See Before you Die.” While they have never quite achieved the megastardom that comes with commercial radio hits, their shows are a joyous and memorable experience for anyone lucky enough to catch them. You only have to see them once to understand why they are one of the most unique and exciting acts in live music. While the outlandish antics, the carnival of freaks, the confetti cannons, and even a larger-than-life installation of balloons made especially for the Houston crowd make for a spectacular evening, the true magic of The Flaming Lips lies in something far simpler. These guys truly love playing live music, and after 17 years as a band, they still wholeheartedly enjoy making music together. In an era where boy band break-ups are considered front-page news, it’s heartwarming to bask in some of music and pop culture’s pure and simple pleasures. As they often do, the Lips closed out the night with the most well-known song in their catalog, “Do You Realize?.” The crowd joined in and lent their voices to the night air, leaving a resonant echo that lingered even as the crowd exited the gate. This intangible echo, as fellow music lovers will attest, is the reminder that you were just a part of something great. If this first mini-festival is any indication of things to come, White Oak Music Hall seems primed to deliver a lot of great nights to the city of Houston.